You have many choices for Christmas plays in Western New York but one with very high production values and a charming plot is MISS BENNET: CHRISTMAS AT PEMBERLY in the beautifully appointed Shea's 710 Theatre (Main at Tupper). The story brings two likeable misfits together under the mistletoe on a lavish set. 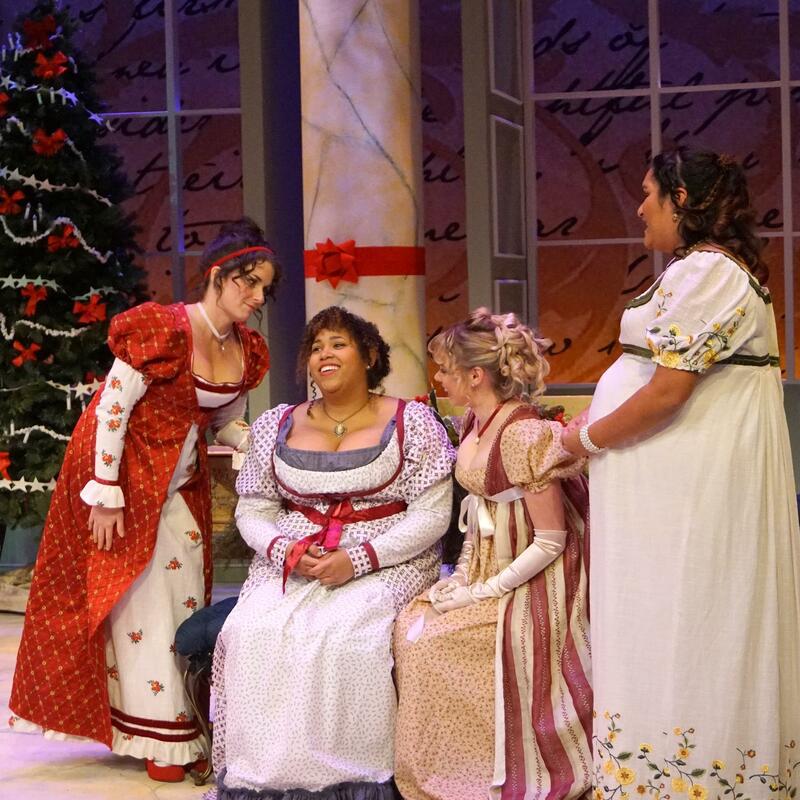 The Bennet sisters collaborate in MISS BENNET: CHRISTMAS AT PEMBERLY in the beautifully appointed Shea's 710 Theatre (through December 23). Theater Talk: Main Street will be jumpin' tonight at Shea's, Alleyway front and back, and 710 too! Main Street's Theater District will be alive tonight as Shea's heads into its final weekend of HAMILTON, THE MUSICAL while on the same block are three openings: the traditional A CHRISTMAS CAROL opens at the Alleyway while up front in the Alleyway Main Street Cabaret, Todd Warfield's wild and wacky A VERY, VERY TRUMPY CHRISTMAS CAROL overlays today's politics on the old story, and, at Main and Tupper Streets MISS BENNET: A CHRISTMAS AT PERMBERLY opens at Shea's 710. Theater Talk: HAMILTON continues; BARCELÓ ON THE ROCKS takes us back to "The Heights"
HAMILTON is a cultural phenonmenon, introducing new audiences to musical theater with a mixed race cast singing in a mixture of styles in a touring production at Shea's that does not diminish the Broadway effect in any way. Tickets are available. The setting of Lin-Manuel Miranda's earlier musical, IN THE HEIGHTS, is reprised in Raíces Theater Company's BARCELÓ ON THE ROCKS, set in NYC's Washington Heights neighborhood, and it opens tonight at the Manny Fried Theater. SIVE at Irish Classical is closing this Sunday. If you haven't gone, go. For an equally powerful theater experience see August Wilson's KING HEDLEY II at the Paul Robeson Theater. CHRISTMAS OVER THE TAVERN may be sold out, but for the holiday spirit see MY THREE ANGELS or NUNCRACKERS.